Hurra, my child wants to learn to write numbers! Montessori Materials provide a structure for children to learn by themselves. 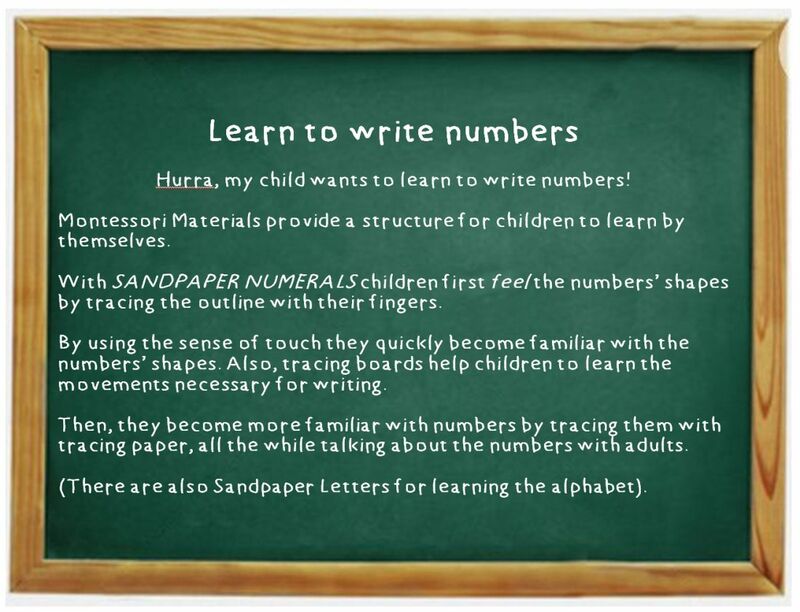 With SANDPAPER NUMERALS children first feel the numbers’ shapes by tracing the outline with their fingers. By using the sense of touch they quickly become familiar with the numbers’ shapes. Also, tracing boards help children to learn the movements necessary for writing. Then, they become more familiar with numbers by tracing them with tracing paper, all the while talking about the numbers with adults. (There are also Sandpaper Letters for learning the alphabet).